The world’s population has doubled since 1960. The water supply has not. The United Nations Environment Programme predicts that in 25 years, more than half the world’s population will struggle with water shortages—with no part of the globe left unaffected. Already, international conflicts abound over shared water resources like the Nile. Rising sea levels precipitated by global climate change threaten to spoil freshwater sources in low-lying countries like Bangladesh. And one needn’t look further than the E. coli outbreak in Walkerton, Ontario, to appreciate the deadly consequences of a compromised water supply. If water proves itself “the oil of the 21st century,” as so many people believe, researchers at the Brace Centre for Water Resources Management at McGill University believe now is the time to think seriously about the wet stuff, even in Canada, a country (once) known for abundant, sparkling rivers and lakes. The Brace Centre is drawing together agricultural, environmental and engineering experts to ensure the world’s finite water resources don’t dry up. Thanks to a bequest from the late Major James Henry Brace, a civil engineer who spent much of his career building water-related projects, the original Brace Research Institute was founded in June 1959 as part of the Faculty of Engineering. The Institute’s research mandate concentrated on making dry land agriculturally viable. Forty years later, the Institute joined forces with the Faculty of Agricultural and Environmental Sciences‘ Centre for Drainage Studies. The Brace Centre was born, and with it a research focus on the control of water quality and a renewed drive to change the way we think about water. These multiple streams of research flow well into the Centre’s Lake Champlain project. Phosphorus levels in Lake Champlain—a 1,130-square-kilometre body of water straddling Quebec, Vermont and New York—and its Missisquoi Bay are of particular concern. While phosphorus helps plants grow on land, unnaturally high levels of phosphorus in the water cause excessive aquatic plant growth, including toxin-producing blue-green algae, which throw the entire ecosystem off balance. The main contamination comes from manure on nearby farms, from which phosphorus travels through the soil and into watersheds. 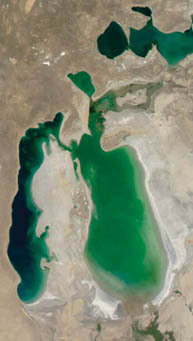 Satellite view shows the retreating shore of the Aral Sea, formerly one of the world's largest inland seas. Image at left was taken in 1989, at right in 2003. For the past five years, the Brace Centre has deployed engineers and environmental scientists, health specialists and climate modellers to the Missisquoi Bay to tackle the problem at many levels. First, the team maps, then ranks, the extent of phosphorus pollution in various parts of the bay to identify watersheds contributing most to Lake Champlain’s contamination. At the next stage, that information feeds into field investigations. Using state-of-the-art soil probes and water-sampling equipment, the team measures how the level of pollution differs according to type of crop, soil and climate. Intensive analysis of the problems found in the field moves the research up to the next level: developing hydrological models and computer simulations. Once the polluters are identified, the researchers can suggest precise changes at the level of individual farms. According to Nathalie Tufenkji, a Brace professor and a Canada Research Chair in McGill’s Department of Chemical Engineering, such changes might include something as simple as deciding how much manure can be safely spread at a certain distance from a water source. 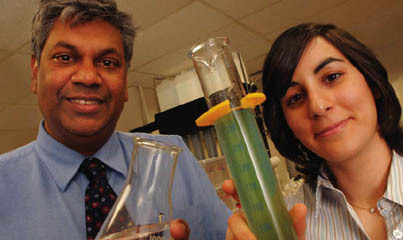 Tufenkji is a chemical engineering professor who is just beginning a three-year study of the mechanics of how various organisms interact with different soils to determine potential for contamination. Falling under the jurisdictions of Quebec, Vermont and New York, Lake Champlain serves as an apt metaphor for the local and global importance of clean water, as well as the Brace Centre’s international vision. The Centre’s researchers are working with the Lake Champlain Research Consortium, Quebec’s Ministère du Développement durable, de l’Environnement et des Parcs and the Vermont and New York departments of agriculture—they’re even using satellite images from the US National Oceanic and Atmospheric Administration in their modelling. The research flowing from the Brace meets a deep thirst for water management expertise all over the world. In addition to a decade-long investigation into how Egypt can conserve and reuse irrigation water, Brace is active in five former Soviet Central Asian republics. For the past five years, the Centre has trained people in Kazakhstan, Kyrgyzstan, Tajikistan, Turkmenistan and Uzbekistan to use water wisely during the region’s dry season. Fifty years ago, the Aral Sea was the world’s fourth-largest inland body of water. Decades of gross water mismanagement, however, took a horrible toll, reducing the sea’s volume by 75 per cent and tripling its salinity. The Aral Sea will never return to its former glory. Smith travelled to Uzbekistan to investigate irrigation approaches that would return the most nutritious food using the least amount of water. Irrigating every other row saves 20 to 30 per cent of water without compromising the crop yield, Smith found, a reduction that is “not trivial in a place that is so water limited.” Planting drought-adapted, high-protein vegetables that thrive on low water, such as green gram, a legume indigenous to Asia, is also helping farmers adapt to the newly arid conditions. The Egypt and Central Asia projects are close to completion, but international demand for water management will continue to keep the Brace Centre hopping. In September 2006, the Centre will offer Canada’s first Master’s in Integrated Water Resource Management. In the field, a new pilot project will explore how phosphorus-hungry reeds can safely, and naturally, filter polluted water. Smith is excited to further explore the peculiar physiologies of plucky plants. Tufenkji is beginning an examination of how nanotechnology (those super-tiny, custom-manufactured structures that are set to revolutionize everything from energy production to stain-resistant trousers) is dispersed in the environment, particularly with respect to contaminating water supplies. On a larger scale, the Brace is starting a new Canada-wide examination of water quality—funded by the Max Bell Foundation—with an eye towards encouraging good agricultural practice and penalizing pollution. And this is just the beginning. Funding for the Lake Champlain project came from the Fonds québécois de la recherche sur la nature et les technologies. 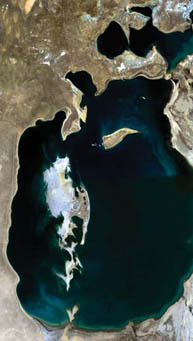 Funding for the Aral Sea project came from the Canadian International Development Agency.